Losing your dog is traumatic and overwhelming for everyone involved. But remember, time is of the essence so there’s no sense wasting time assigning blame. Accidents happen, the most important task now is concentrating on finding your lost dog and getting the word out. We’ve put together the following action plan that we hope will help organize your search. 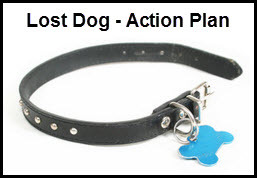 Place food, water and familiar items outside, in the area where your dog went missing from, or was last seen. (e.g. dog kennel, dog bed, blanket, your coat, or anything that has your scent on it) Continue to keep food & familiar items out in that area, until dog is found. Make poster size signs and post at nearby intersections and in front of home where dog went missing from. Be sure to use bright colored poster board and make the letters large enough for drivers to see. Post a Lost Dog Ad on internet sites: The most popular is craigslist. Post in the lost and found section as well as pet section. Use a descriptive Ad title (Lost Dog, Brown Mini Dachshund) also in your ads description post as much information as possible including where he was last seen and the best picture you can find. Aside from Craigslist other sites you can post on are: Petfinder.com, helpinglostpets.com. Place a Lost Dog Ad in your community newspaper. Be sure to post under lost and found in the classified section. You may also want to contact local radio stations, some will make a free public announcement of missing dog! Please go to the area with food & leash. Remain calm. As soon as you see your dog, lower your body down to the ground and use familiar – positive words like “treat” or “go for walk” etc…If your dog is normally a little shy around strangers, he or she may not even come to you right away! If this is the case, we recommend that you place strong smelling food, like canned tuna, and familiar items with your scent on it…near the area right away! !…and alert everyone not to pursue the dog, if seen. The goal is to keep your dog in that area. If food, water, & shelter are easily accessible for him/her and is not forced to run, out of fear, most likely your dog will stay near-by…then you have the opportunity to try different techniques used to lure and safely catch your dog. Most of all….NEVER GIVE UP!